I did it. I successfully made it through fetoscopic surgery and contributed to medical research in the process. It has been a memorable experience, to say the least. Day 1: I arrived at Texas Children’s Hospital at 5:45 a.m. to begin prepping for surgery. I felt a mixture of emotions. A part of me felt terrified, but another part felt ready to get it done. My husband and I were taken to an exam room where I had to prep my skin with chlorhexidine gluconate wipes and put on my hospital gown. Nurses then drew blood and inserted IVs. Next, the anesthesiologists came in to give me an epidural. Before I was taken to the surgical room, my family came in with hugs and final words of encouragement. The last thing I remember is my nurse coordinator holding my hand as I drifted off to sleep. While I was fast asleep, what took place is nothing short of amazing. Medical teams from Stanford, John Hopkins, Barcelona and France observed as a team of doctors removed my uterus and inserted two small ports. Through these two small incisions, they were able to operate on our baby using scopes and close the opening in his back, protecting his spinal cord from further damage. The process included draining my amniotic fluid and filling my uterus with carbon dioxide, so they had room to work. My little boy also got a shot to put him to sleep during his portion of the operation. When doctors were finished making the repair, they put a saline solution and some antibiotics back into my uterus. Within 24 to 48 hours, that solution recycles back into normal amniotic fluid. From what I have been told, they finished up by putting my uterus back and stitching up my C-section-like incision. The actual surgery took about four hours. By mid-afternoon I was waking up on the ninth floor in labor and delivery and feeling like I had just gone to sleep minutes ago. The next three days: I received a drug called magnesium sulfate to relax my uterus and prevent contractions. One potential risk of the surgery is early labor. 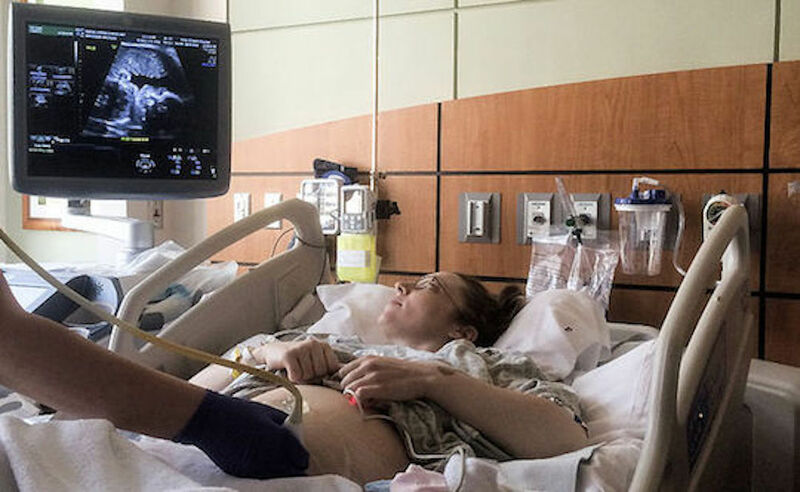 In addition to the magnesium sulfate, I also still had in my epidural and was attached to monitors that looked at the baby’s heartbeat and my contractions 24/7. It was reassuring to hear his little heart beat and movements. That first night, despite being a little bit out of it because of the drugs, I remember waking up anytime he moved away from the monitor. I guess it’s true what they say about a mother’s instinct. Although I worried about him a lot and still do, he has proven to be one strong little man. He bounced back from the operation quickly, kicking and moving often. I felt so relieved and grateful knowing he was okay. Day 4: I was finally able to have my epidural removed and get off the magnesium sulfate. My body ached from not moving and it felt so good to be able to get out of bed and slowly begin eating again! I was moved to another floor for the next three days and released exactly one week after the fetal surgery. My husband, mom, dad and sister were by my side through the entire process. They definitely provided the emotional support I needed and my sister threw in some comic relief too. Although, I wouldn’t recommend laughing too hard post-surgery! My husband and I have also been fortunate enough to get a room at the Houston Ronald McDonald House where we will be staying for a 45-day stretch. What it has been like living here is a whole other blog post. All I can say is that there are so many wonderful people in this world. Our baby boy successfully underwent his first surgery. Sometimes, I still can’t believe that is possible! The fact that doctors from around the world also flew in to watch and learn is something I have struggled to wrap my head around as well. I am just a small-town girl from Reynolds, Illinois, who is having her first baby. Never would I have imagined that my little boy and I would be undergoing an experimental surgery and contributing to medical research that may shape the future. My doctors, Dr. Michael Belfort and Dr. William Whitehead, are leading the way when it comes to fetoscopic surgery for spina bifida. I feel so blessed to be a part of their quest to make this surgery the new standard of care for mothers everywhere. Everett John Kerres was born on Sept. 20, 2016, at Texas Children's Pavilion for Women. For an update on Everett, click here. If you're interested in learning more about the Kerres family and fetoscopic repair of spina bifida, click here.